You did it: you’re finally female. You’ve been full time for a decade, you’ve got a good job & career, you’ve reconnected with loved ones and resolved those issues, your presentation is classy and other women embrace you as totally female. What’s the final steps to completely finish transition? You’ve probably already done this - but you need to almost completely disconnect from “trans-world”. I’m not saying you abandon old friends. Rather, let go of perpetuating controversial transgender subjects on-line: on Facebook, etc. Quit posting “modeling” photos in hopes of getting compliments, quit going to most transgender events. We live in a binary society: there’s men, there’s women. You’re now a woman. Its time to live, breath and grow in that community. Stick to this until at least eight out of your best female friends are born-girls vs. trans-women - versus the other way around. This lifestyle change will result in more joy and happiness. Your aim is simple: become “a woman who happens to be transgender” vs. “a transgender woman”. You’ve arrived - live it. The last thing most transsexual women want to proudly share with others is her FICO score or personal financial statement. A gender transition is often devastating on a gal’s finances. Surgical costs are overwhelming, building a decent femme wardrobe is insanely expensive and all this happens while our ability to earn a decent living is often impaired. Bankruptcy is quite common - often necessary - in our community. However, now that you’re past transition - its time to start rebuilding your financial future. We start by improving our credit rating, exercising restraint with beauty and fashion purchases and embracing: “paying ourselves first” - as an essential human condition for creating “savings”. I was once a transgender volunteer and community leader. I later realized I undertook those roles from my sense of passion. However, I should have been more focused upon first building my non-trans life and establishing a more comfortable financial future. “My Girls” - the one’s I directly helped with phases of transition will be the first to tell you how brutal I am about making finances a priority as soon as it's remotely possible. Lack of post-transition financial success and stability is a big drag on our community - no pun, intended. We love writing stories about how we went from male to female. What we really need? Excerpts about how we became more financially successful as post-transition women than we did as men. Achieving financial strength is often another decade long process. However, getting it done results in the same sort of inner joy and personal freedom you found after successfully accomplishing transition. Every trans-woman has a “victim story”. For some of us? Its part of our identity. However, if you’re going to get on with the life you worked so hard to create, you’ll need to delete this aspect of your journey. With each new day of your new life, the old memories will become more distant. Leverage that effect by letting go of past hurts and tough circumstances with your life and transition. Celebrate the now and immediate horizon. There’s no progress in living in the past! Early in our transition, we often go out of our way to eliminate all things male: in our psyche, habits and hobbies. However, those years of male experiences can serve your new woman well in a challenging world. Don’t be afraid to “butch it up” when needed and draw upon that prior experience and energy. It's a part of you - and all your aspects are what make you so very beautiful. 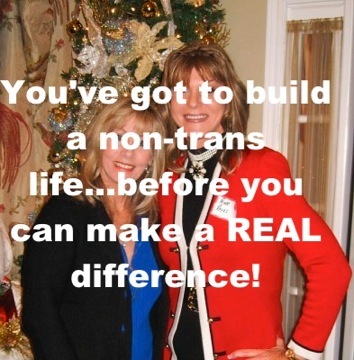 Now that you achieved the pinnacle: a lovely woman who also happens to be transgender - that lives intently as a female in a non-trans-existence and you’ve achieved personal financial strength? Its time to give back to future generations. I try to limit my “community involvement” to writing at this website and occasionally mentoring select gals on transition. My give-back beyond this website? I’m presently inspired to accomplish new entrepreneurial dreams. I’m hoping by accomplishing those visions I’ll be in a position to help support the many community causes that go unfunded. We’ll see. Alas, we all need to try and give back in a meaningful way. We all need a decent “give back” plan. What we do for others? Its all that remains when we’re gone!